World Cup 2014 was a great one. But what does the future hold? Copa Mundial 2014 was a wonderful tournament, despite the bad officiating, diving and cannibalism. We saw the emergence of new stars (what do you mean it’s pronounced “Hahm-es”? 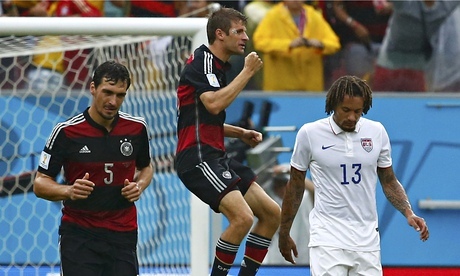 ), brilliant swan songs by old stars (here’s to you Miroslav Klose), dramatic overachieving (hail Ticos! ), epic flame-outs (remember back in the old days when Spain was good? ), spectacular individual performances in service of doomed causes (Memo Ochoa and #thingstimhowardcouldsave come to mind) and a whole lot more. Best of all, in the end the best team won. It wasn’t pretty, but the Yanks advance. What next? Also, the ghost of Landon Donovan. The US Men’s team lost to Germany today, but thanks to Portugal’s win over Ghana the Americans advance anyway. 10 stray thoughts, in no particular order. Black Stars vs. Die Mannschaft was my prediction for Brazil after Copa 2010 in South Africa, but a lot has changed. Four years ago, in the aftermath of Spain’s World Cup win, I ventured a bold prediction for the 2014 Copa final: Germany vs. Ghana. Alexander Putin may not be preparing to invade Europe, but he understands the value of spectacle in establishing a nation’s place in the world. Wow – imagine my surprise at discovering that the German language has a word for music! And so do we. We pity da fool who fails to grasp the spiritual enlightenment freely available to all in the teachings of Mr. T. For starters, Mr. T has an important lesson about family. Specifically, he’s got something to say about yo mama your mother. Welcome back my friends, to the show that never ends. Or maybe it just seems that way. Today’s episode of SVR owes entirely to the mad genius of our friend Mike Smith (he of Fiction 8 infamy), who has way too much spare time on his hands. Said spare time is apparently spent scouring the frontiers of YouTube for videos that should never ever have been made. As these offerings prove, we live in a strange and dangerous world. First, what are they putting in the water in Sweden, anyway?